One of the best parts of spring is the arrival in the markets of fresh, plump berries. 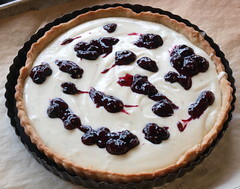 I always get the itch to make a tart or pie with fresh berries at this time of year, and while shopping I also sampled some excellent fromage blanc. I decided instantly that they would be perfect in a dessert together. 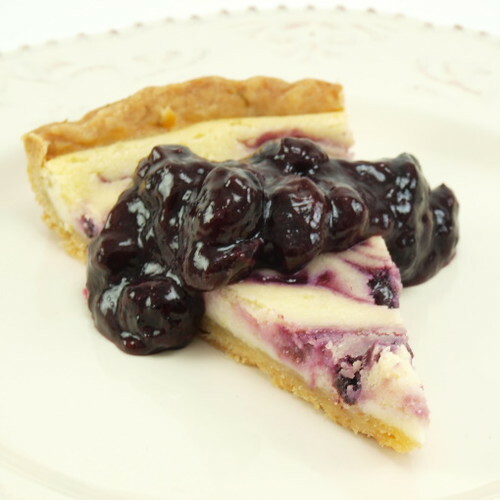 This tart is the perfect blend of mouthwatering tang from the cheese, bright citrus flavor from the lime, and earthy sweetness from the fresh blueberries. 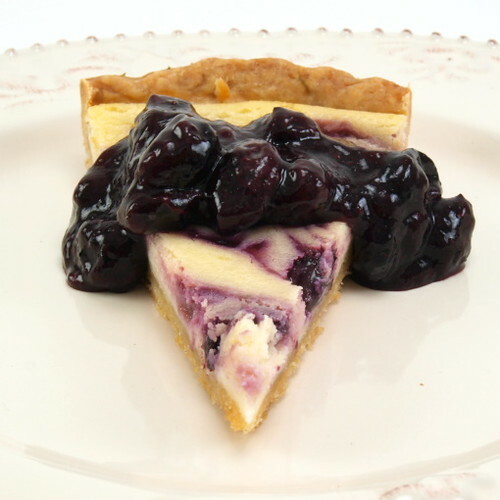 To me, this tart just screams spring, and topped with a little of the extra blueberries, warmed slightly, it is absolute heaven! You can substitute cream cheese for the fromage blanc if you can’t find it, but if you do be sure to replace the heavy cream with sour cream so you get a little more of the sharpness. 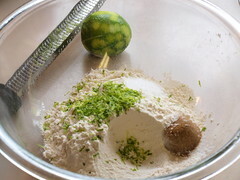 In a large bowl combine the flour, sugar, lime zest, and salt. 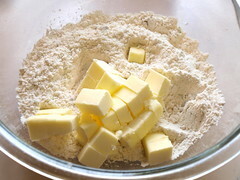 Mix well, then add the chilled, cubed butter. Rub it into the flour mixture with your fingers. 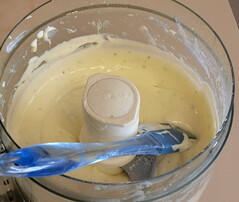 You will want about 30% of the butter to be in pea sized pieces, while the rest is blended in well. 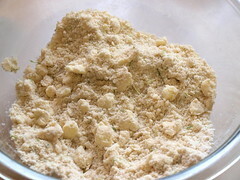 Add the cold water, starting with three tablespoons and adding the fourth if needed, and knead about ten times. Form into a disk, cover with plastic and chill for 30 minutes. While the dough chills prepare the blueberries. 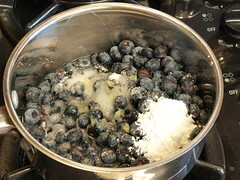 In a medium sized pan mix the blueberries, cornstarch, sugar, lime juice, and water. 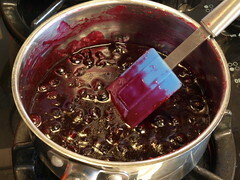 Cook over medium-low heat, stirring constantly, until thick and the berries have burst, about ten minutes. Let the mixture cool to room temperature. Heat the oven to 425 F and line a baking sheet with parchment paper. 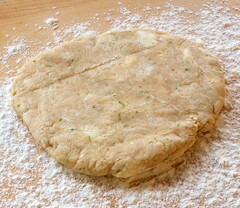 Roll out the dough for the crust on a well floured surface. Line the inside of the tart pan with the dough, making sure not to pull or stretch the dough in the pan, and trim off any excess. 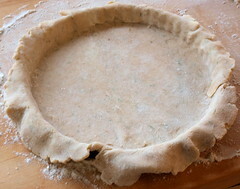 Dock the dough with a fork then line the crust with parchment and add pie weights, beans or rice. Place the crust on the prepared baking sheet and bake for 10 minutes, remove the weights and parchment and bake for 10 additional minutes, or until the crust is golden brown. Lower the oven to 350 F.
In the bowl of a food processor add all the ingredients for the fromage blanc filling and process until very smooth and creamy, about a minute. Scrape the bottom of the bowl and process for thirty seconds more. Pour the cheese filling into the crust and spread it evenly to the edges. 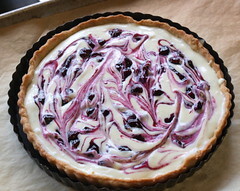 Add half the blueberry mixture by spooning the berry mixture by the rounded teaspoon evenly around the tart. 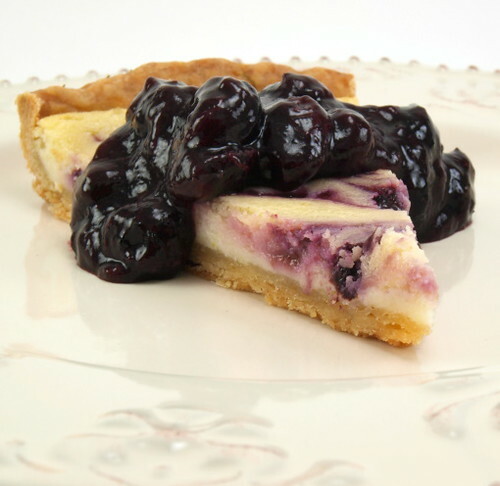 Take a knife and swirl the blueberries. Do not over-swirl. 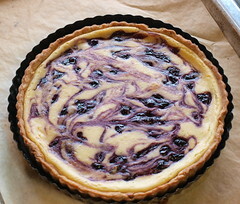 Bake for 25 to 30 minutes, or until the center of the tart is only slightly jiggly and the tart is puffed all over. Turn off the oven and crack the door and allow to cool for thirty minutes before removing from the oven to cool completely on a rack. 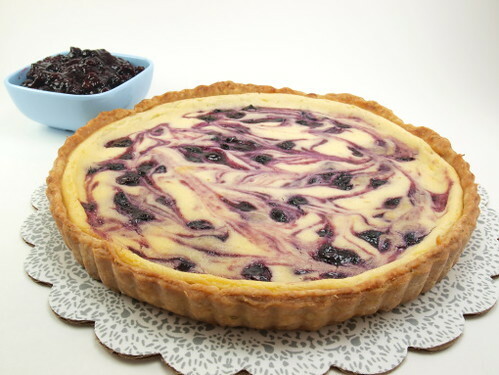 Serve the tart with the additional blueberry sauce. Enjoy!